The principal of an elementary school in one of the state’s smallest counties was named Wells Fargo North Carolina Principal of the Year for 2017 during an awards luncheon today in Cary. 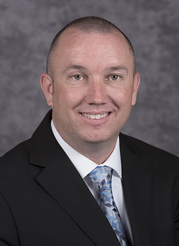 Winning the title of the state’s top school administrator is Jason Griffin, principal of Hertford Grammar School in Perquimans County, near Elizabeth City in the northeastern corner of the state. Griffin was selected from a field of eight regional finalists chosen earlier this year following interviews and visits to their schools by the selection committee for the award. State Superintendent Mark Johnson said Griffin exemplifies the qualities of leadership essential for helping teachers excel and students to achieve. “Hertford Grammar School’s strong progress is clear evidence of Jason’s leadership,” Johnson said. The Title I school, where nearly two thirds of the 400-plus students are from low-income families, achieved a school grade of “B” for the first time last year. The school, which enrolls third through fifth graders, was also just one of six elementary schools in the state’s northeast education region to earn at least a B while also exceeding their targets for academic growth. Johnson also recognized Wells Fargo for its longtime sponsorship of the state’s Principal of the Year program, which was started in 1984. “Wells Fargo’s consistent and enthusiastic support for this important recognition helps highlight the critical role that principals play for teachers and students across the state,” he said. In naming Griffin the 2017 Wells Fargo North Carolina Principal of the Year, Wells Fargo Senior Community Relations Manager Juan Austin said, "Our education system has never been at a more critical juncture than now, and with administrators like Jason, we can see how dedication and effort connects with students, staff and parents on so many levels at Hertford Grammar School. “So I'm pleased that we have the opportunity to reward his outstanding work and hold up Jason’s example for others to hopefully follow." Griffin joined the faculty at Hertford Grammar in 2011 as a third-grade teacher and served as dean of students before being named principal. He was previously a second-grade teacher at Perquimans Central School, from 2008-2011, and started his education career in 2002 as a third-grade teacher at E.J. Hayes Elementary School in Martin County, where he taught for six years. A graduate of East Carolina University, where he received a bachelor’s degree in elementary education, Griffin went on to earn a master’s degree in middle-grades mathematics from ECU, a master’s in school administration from Elizabeth City State University and an education specialist degree from ECU. He was teacher of the year for Perquimans County Schools in 2012 and participates in numerous leadership activities in the district. In his submission for the principal of the year award, Griffin cited as his greatest accomplishment as principal was leading Hertford Grammar to its performance grade of B – noting that five years earlier, the school was facing “corrective action” from the state. “I believe my leadership style, collaboration with our district personnel, hiring effective teachers, and my understanding of schoolwide data has helped Hertford Grammar School become one of the most improved schools in Region I and in North Carolina,” he wrote. · Western: Doris Sellers, A.C. Reynolds High (Buncombe County Schools). Regional winners will each receive $1,000 for personal use and $1,000 for their schools. As Wells Fargo Principal of the Year, Griffin receives $3,000 for personal use and $3,000 for his school. He also receives professional development and resources supporting global awareness in the curriculum for his staff thanks to Education First Tours, and a custom­made NC Principal of the Year signet ring and pendant from Jostens Inc. While continuing to lead his school next year, Wells Fargo will furnish him with a stipend to travel across the state as an ambassador for education. He will serve as a member of the State Superintendent’s Principals’ Advisory Committee, as an advisor to the State Board of Education and also to the board of directors for the NC Public School Forum. In addition, the N.C. Department of Public Instruction will sponsor his enrollment and completion of the Education Policy Fellowship Program and he will compete for national recognition through the NC Principals and Assistant Principals Association. He also will chair the 2018 Wells Fargo North Carolina Principal of the Year Selection Committee. Additional information about the NC Principal of the Year program, is available online. You also can follow the North Carolina Principal of the Year finalists on Twitter at #NCTOYPOY.